Northward bound: When flapping wings mean RUN! 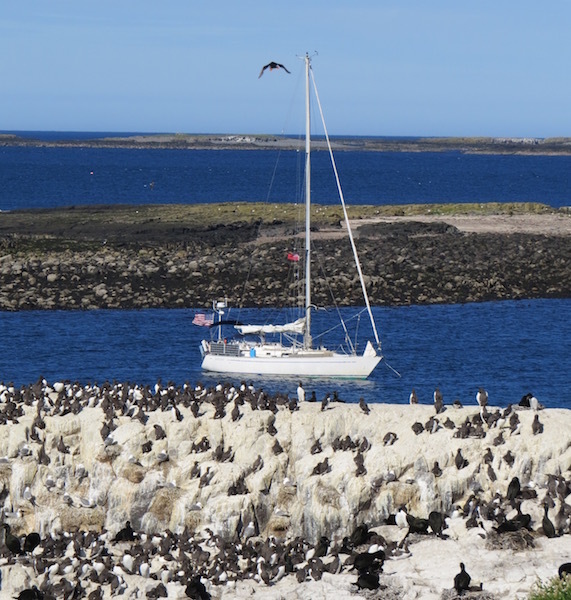 If you ever have the chance to visit the Farne Islands, do so. We were planning an overnight to Peterhead with a sail-by of these islands. Yet, an updated weather forecast showing settled winds – good for anchoring in its semi-open roadstead, with better winds for sailing forecast for the following night – altered our plans so we decided to anchor at these islands where the National Trust monitors a bird sanctuary. Our approach from the south put us right in front of the cliffs where a bunch of birds nested. We ended up anchoring (our first of the year) in the small harbor where one other sailboat shared this small bay along with several excursion boats moored while more arriving. Not being totally prepared for the visit, the three of us launched the dinghy but without the electric motor. Noticing the brisk wind and current, we decided to test our ability (well, Chris and Max’s anyhow :) ) to paddle ashore. Notice the dinghy’s still tethered to the boat during this practice row. returning as more day trippers arrived while others were leaving. As we were walking up, the long line of visitors who came by excursion boats mentioned we better have hats. Hats? Well, Max and Chris had ball caps, and I ended up wrapping my head in a fleece pullover then jamming the visor back on. Functional but definitely not attractive. Must say I couldn’t blame those kids I saw pointing their eyes at me then giggling. But, boy, we were all very glad we had covered our heads. The attack of the terns began as soon as we got close to their nests dotting the ground. but we quickly discovered their appearances were deceiving. We had just entered a scene from Alfred Hitchcock’s film The Birds. These birds were pecking the heck out of people. My sister Betsy wouldn’t have gotten out of the dinghy as she’s not a huge fan of swooping feathered animals to begin with, and she definitely wouldn’t have liked the scene we walked into. Max’s blue color seemed to draw the most attention, and the poor guy probably didn’t unhunch his shoulders until he got back in the dinghy. Whatever he said to the wee fella didn’t work, and both Chris and I knew to keep our distance. Yet, we couldn’t resist the opportunity to film these shrieking banshees. Furthermore, everyone began to get some white streaks somewhere on their person. Of course, the sign at the top of the walk should have been our first clue. At the cliffside nests we ran into a group of school kids, two of them looking a bit stunned by it all. Must say none of us could stop laughing. And, for those who know my sense of humor, such as my brother, know I definitely couldn’t stop laughing. Next to the paths we saw painted rocks with numbers, which indicated the terns’ eggs. If our friend Jayne had been here, we would have gotten the best tour ever. I kept thinking of how much we’d learn. But, we did meet a wonderful young monitor with whom I posed, head gear and all. I had no idea puffins burrowed into the grounds for nesting. We also heard about a puffin party. The event occurrs at night when all the fledglings shuffle out of their nests en masse after three to four weeks nesting, head to the sea, and jump in to begin their pelagic lives. Pretty cool if you could witness this annual event. I guess that would make it worth being splatted in white and head-jabbed. We asked the monitor why the blackheaded gulls were attacking the puffins. She said the gulls weren’t trying to harm the puffins and their chicks. The gulls were after the food the puffins were catching. Which is why we glimpsed some of these clowny-looking birds huddled in their holes with beaks full of silvery, dangly fish. We continued our walk around the island heading back to the quay area. I loved the colors of the black-and-white birds against the blue sea. They looked like penguins at one point. We visited the chapel where we saw a memorial to Grace Darling, the Longstone Light Keeper’s 23-year-old daughter. She helped save some passengers aboard ss Forfarshire, a floundering steamship in 1838 when she and her father rowed to the sinking ship. They managed to save nine of those aboard. A memorial to her with an inscription by the poet Williams Wadsworth stands in the church. Farne Islands are also where Cuthbert, that monk/biship/eventual saint lived as a hermit for awhile. But, the birds were truly the best attraction. And, again, Max became the main attraction. The island was open 1:30 to 5:30, and we ended up being the last ones there. On our way down to the dock we met up with the lovely young woman who greeted us when we first landed. Like those working at the English Heritage Centers, the National Trust people were welcoming, informative, and just great to be around. We were wishing we could host them all on JUANONA but realized it’d be a tight fit if all 12 came aboard. Back on the boat we proceeded to remove our protective gear only to discover some of us weren’t as protected as they had thought. With that, we got ready for dinner and an early start the next morning for our overnight to Peterhead. This entry was posted in 2015 06 UK - East Coast, 2015 Summer Cruising, SUMMER CRUISING on June 15, 2015 by margaretlynnie.